It’s the most wonderful time of year…baseball season! America’s favorite pastime is back in full swing (pun intended) and we are all here for it! There’s no better way to kick off the season than by attending the 2019 Minnesota Twins Home Run Lunch presented by Mortenson Construction. Last Friday, the Saint Paul Area Chamber of Commerce and Minneapolis Regional Chamber co-hosted this spectacular event by bringing members of the business community together over a shared love for one of Minnesota’s favorite teams. 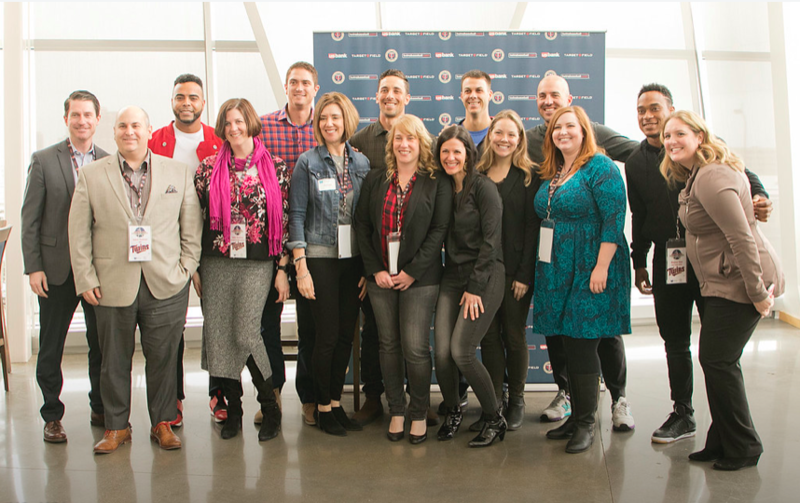 Though attendees weren’t able to enjoy the Twins stadium in its entirety (oh yea… it snowed 10 inches in April, super cool), spirits were high, especially when the Twins players dropped by. The Saint Paul Area Chamber of Commerce and Minneapolis Regional Chamber do a fantastic job at providing local networking opportunities, keeping members engaged on legislative updates, and backing important charitable causes. During the MN Home Run Lunch, partial proceeds were given to the Minnesota Twins Community Fund. Hey Siri. Hey Alexa. Hey Google. Chances are you’ve said at least one of these phrases in the past month. Technology has radically changed our lives as smart phones can answer just about any question we need, can control every electronic device in our house, give us instantaneous news, and connect us to the world. Convenience is the name of the game, but it’s also comes at a cost. The New York Times new Privacy Project is taking an in depth look at the state of technology today and what citizens are trading for convenience. They’re looking at policy, how consumers interact with data, technology companies, and how their own company tracks, collects and shares data with advertisers and tech giants. Working in public relations and politics, it’s easy to see the value of collecting data to better understand target markets and reach your audience. It helps us target ads, messaging, products and ideas that are tailored to individuals, and helps clients more easily reach the public. And let’s be real, my Instagram and Facebook seem to know exactly what shows I want to watch, what books I might enjoy reading, and what events in my community would be of greatest interest. But to get this data, it means trading away personal information from the seemingly innocuous like gender and age, to the more personal like where I go and what I purchase. The Privacy Project is discussing a wide variety of perspectives and issues surrounding technology and data mining, including some of which I had not previously considered. One article that sparked my interest was how women interact with technology. We all know that it’s important to protect our personal information, but the internet experience can be a vastly different for women than it is for men. Online harassment, threats to women’s well-being, and stalking affect women more often, and they’re more likely to have stricter privacy settings on their social media accounts, post fewer photos online, and are less likely to share their relationship status or political views on the internet. I expect this project to include more interesting perspectives and ideas to broaden our discussion around technology, as we navigate where we go from here. Technology is the new and ever-changing frontier, and as a society, as communicators, as companies, as citizens and as governments, we’re all striving to find a balance between convenience, privacy and how our world will look going forward. I think it’s an interesting and worthy conversation, and I know I’ll be following The New York Times’ Privacy Project. But in the meantime, Hey Siri, play “Every Breath You Take” by the Police. KK went on TPT’s Almanac Friday to discuss the MN legislative recess, taxes, Ilhan Omar, President Trump and Amy Klobuchar on the political panel. As a small business, the more money we invest in our company and employees, the better off we all are. We need tax policies that will let us do that. We have three employees and every penny is accounted for - salaries, expenses, taxes, savings that will be reinvested in our business, new hires, etc. We appreciate all of the legislators at the local, state and federal levels who continue to work for common sense tax policy every day. We know there’s a balance between important government spending and advocating for lower taxes, but if everyone believes that growing our economy takes businesses taking risks and hiring, then we will all move in the right direction together. It’s easy to get caught in the grind of day to day work. One way to boost creativity and network is by joining a board. Getting involved in something you’re passionate about will keep you motivated and will give you an alternative space to pour your energy into. Depending on the board, finding and joining isn’t a huge task. There are many boards that seek out candidates just as diligently as you are looking for them. Generally, there are two types of board positions, a paid member and a volunteer seat. Whether you’re vying for either position, make sure to research existing members, be well versed on the organization, and offer expertise that they might be missing. This sets you up to be a top candidate and demonstrates sincerity. · Do you believe that the existing members have a shared vision of the organization’s strategy and capabilities? · Do your goals mesh with organizations? It’s becoming more popular for organizations to nominate younger professionals to boards or create a separate board entirely. Young professionals bring a different perspective to the table and those who have technological skills are in high demand. Joining a board is a great way to market yourself and share your talents so treat the process like it’s a job interview. Spruce up social media accounts (especially LinkedIn) and familiarize yourself with news or anything policy related to the organization. Be prepared to answer questions about collaboration, problem-solving, and communication. Regardless if it’s a paid position or not, existing members want to be sure that they’re aligning themselves with someone who’s honest and will represent the organization well. Like any job interview, if you’re not selected, it’s still a great learning experience and there will be other opportunities. Here at KK & CO, our team is invested in many projects outside of the company. This spring, Mary Kuna joined the Young Professionals Board through Special Olympics of Minnesota. Mary has devoted her time as a coach, volunteer, and cheerleader to her older brother, Robert, who has down syndrome. As an account executive, Mary is excited to bring her knowledge of grassroots issue advocacy to the Young Professionals Board. An in-depth conversation about the results from the first poll from the newly relaunched Battleground Poll, a national bipartisan survey of registered voters in the United States measuring voter sentiment and opinion. This reliable bellwether of national opinion will ask traditional polling questions related to U.S. electoral politics and voter attitudes, as well as gauge voter opinion on the state of civility in our national political conversation. I know you’re busy. Friends, family, work, school, exercise, budgeting, taking the dog for a walk, eating right, cleaning the house, bingeing that favorite TV show—sometimes it feels like our to-do lists never seem to end. But adding volunteering into the mix, even if it’s just once a month will not only make your community a better place, but allow you to explore your passions, grow as an individual, network, and connect with others. By making a difference in the lives of others, you can make a difference in your life too. Let’s start with your passion—what are you good at and what do you enjoy? Maybe you’re an animal lover and you can volunteer at your local pet shelter or foster an animal. Enjoy helping kids? You could sign up for a program like Big Brothers Big Sisters. Passionate about politics? Volunteer on a campaign. Enjoy spending time with seniors? I am sure your local nursing home would love to have you come in and help call bingo or visit with residents. The point is, if you can find something you are passionate about, you will bring that joy to those you are helping and boost your own happiness in the process. Studies show that volunteering makes us feel good, and improves our mental health. Now let’s look at your career. Are there places where you can grow your skills and your network? Maybe you’re working to become a teacher—volunteer to tutor or teach English. Maybe you want to improve your graphic design or public relations skills—offer your services to your favorite charity to help them grow their brand, design invitations or create a new logo. You can grow your portfolio, enhance your resume and get a better understanding of your field by volunteering your time and your talents. Volunteering is also a wonderful way to network, without feeling like you’re networking. It’s a natural way to connect with others, find mutual interests, and also show what skills you bring to the table. These people may not only become friends, but could be a valuable resource to you as you grow your career. Plus, volunteering helps give us a sense of purpose and belonging. If we’re giving back to our community, you’re naturally going to feel more connected to your community. It’s a win-win for everybody. If you don’t know where to start, you can refine your interests and see local opportunities at handsontwincities.org and volunteermatch.org. You would be surprised how many folks are looking for your time and help. Plus, you might just stumble upon a great charity or nonprofit you haven’t heard of yet! Endless possibilities are out there, so add volunteering to your to-do list and see firsthand what a difference you can make in your community. That’s the quote that kicked off another great public affairs series event today with the Saint Paul Area Chamber of Commerce, focusing on women in politics. Being part of a female-owned small business, it was inspiring to hear from other strong female leaders making a difference in our community and state! The event panel included President of the St. Paul City Council Amy Brendmoen, Speaker of the Minnesota House Melissa Hortman, and Dakota County Commissioner Liz Workman. Kiya Edwards of KARE 11 moderated the event. For a panel event with elected officials, the conversation was very candid and honest about how women are leading and making space for themselves in politics, in the boardroom and in the media. Topics covered included mentorship, implicit bias, leadership styles, partisan politics, communication, work-life balance and how to have a career in public service. As we near the end of Women’s History Month, it’s interesting to hear the shared experiences of women, and encouraging to see how these conversations have evolved over time. I think one of the most interesting topics that resonated with me was that women feel they face a narrower path when it comes to leadership style. Leaders often have to make tough decisions and stand up for what they believe in—and that can fly directly in the face of likeability. It’s a conversation that women in leadership roles have faced for a long time, and I expect the issue to come up regularly in the media with a number of female candidates already throwing their hat in the ring for the 2020 presidential race. Just two years ago, the Super Bowl was in town giving the Twin Cities a chance to shine in the national spotlight, and show all the great things our state has to offer. Now, with March Madness in full swing and the Final Four in Minneapolis at U.S Bank Stadium, we get another chance to show the nation, and the world just what we have to offer. Major sporting events in our state can be a challenge at times as everyday citizens face headaches trying to get to work, to school and just around to their normal favorite hangouts, but is also offers an economic boon to hotels, restaurants and our local economy. The Minneapolis Final Four Host Committee expects that Minneapolis will welcome 94,000 visitors in town for the event and see an economic infusion of $148 million. With that and an expected 23 million viewers at home, this is Minnesota’s time to shine and allow local businesses and brands to highlight what they do best. The New York Times picked Five Places to Visit in Minneapolis near U.S. Bank Stadium in a recent article. Highlighted spots include Eastside restaurant and local favorite Faribault Woolen Mill Co. I expect that plenty of visitors will be impressed by our states’ world class dining and shopping! Besides food and hotel stays, brands and businesses of all sizes have a chance to be a part of the action. Major brands including Capital One, Coca-Cola and AT&T are bringing in free concerts from Katy Perry, the Chainsmokers, the Jonas Brothers, and Zedd. Nicollet Mall will be busy with more local and national brands coming into offer food, kiosks, interactive experiences, parades, rallies, TV interviews, and even a giant Ferris wheel! There are a wide array of opportunities and creative ways for Minnesota businesses and brands to capitalize on the tournament, and get in front of customers and grow their brands. I expect to see a lot of promotional creativity over the next couple weeks! So whether you’re a sports fan or not, there are plenty of opportunities for Minnesotans to get basketball fever with the NCAA Final Four in town and take part in the fun. I know we’ll do a great job showing the world all the great things Minnesota and the Twin Cities has to do, see and experience. Last week, Minnesota’s 2019 Legislative session officially hit the midway point. Over the last several weeks, legislators have spent significant time in committee hearings churning through bills to meet their constitutionally obligated deadline to adjourn on May 20. For the rest of March and into the first weeks of April, the Minnesota Senate and House will compile their respective budgets and there will be numerous twists, turns and surprises along the way. Cutting through the political noise and effectively navigating the halls of the Capitol requires forward-looking political insight and relationships, strategic judgment and persuasive messaging. Let us help you get across the finish line by enhancing your visibility, successfully shaping public perception and persuading decision-makers. Public Affairs Management – Engaging with external stakeholders – including elected officials – has become increasingly important in this highly integrated world. Connecting and building meaningful relationships with an audience not only helps tell your story but also builds a broad base of support and motivates people to act. We have the experience and tools to help you reach new audiences and develop long-lasting partnerships. Media Relations and Messaging – Developing a thoughtful messaging strategy is a daunting task for many organizations and businesses, but it is also a crucial investment. A consistent, clear and transparent message should be a tool that is used to develop relationships and accomplish your goals now and into the future. We build strategic plans that include a wide array of communications tactics to help individuals, businesses and organizations better communicate your message to your specific audience. Crisis and Issue Management –Nobody thinks a crisis will happen to them, until it does. Navigating the fallout can be challenging and stressful – especially if you are not prepared. Let us direct you through these tough situations and proactively implement solutions that will protect your reputation and strengthen your brand. Grassroots Advocacy – Grassroots advocacy is all about building strength in numbers to influence public opinion and government action. At the Capitol, this could be meeting with legislators, planning a day on the hill, preparing testifiers for a committee hearing and engaging members. We can help you channel your supporters’ passion into action. We have a long track record of building and engaging robust grassroots coalitions that will ensure the best outcomes for our clients. With just over two months to go in the 2019 Legislative session, the KK & Co team is on hand for all the action. Time is running out and the pace is picking up, give us a call today to learn more about how we can help your organization succeed. While sending an email is a good first attempt at outreach, making a phone call shows you’re a real person. It’s easy to fall into the comfort zone behind our computer screens, especially when you’re reaching out cold. After you send an introductory email, it’s great to reference it when calling and then this new connection has your number and email on hand for future correspondence. Get out of the office and go meet these new people! Taking time out of your day to meet someone in person shows that you care and that you’re interested. A lunch or coffee aren’t big commitments but they establish a face to name connection and build trust. People feed off facial expressions and body language which is impossible to get from an email or a call. Sometimes it takes a few (or many) calls and emails before you get someone to reach back out to you. That is okay and is the name of the game. People are busy so when people don’t get back, it’s not personal. Keep chipping away and keep updating! A thank you goes a long way. Sending a quick email or text shows your appreciation. This is also a good opportunity to sum up what you’re working on and offer to help on any future projects. Building genuine connections can be tough in grassroots. Starting a new personal or professional relationship with a solid communication foundation is incredibly important. Using these tips has proven to be helpful in our business, hopefully they help you with yours! As a growing small business, it so important to be plugged into our local business community. One way we do that is by joining business-oriented organizations like the St. Paul Chamber of Commerce, who last week held their 151st Annual Meeting at the RiverCentre. The event was fantastic as always! It was great to hear from so many inspiring local leaders including the keynote speaker Michael Roman, the CEO of 3M, who talked about how they’re disrupting the market and growing technologies. Mayor Melvin Carter and Governor Tim Walz also addressed the crowd, talking about how important it is to have a great working relationship between the business community and government—we couldn’t agree more! These events are also an excellent opportunity to network, grow your business and learn about what nonprofits, elected officials, and companies both big and small are doing right here in our own backyard. It is certainly a privilege to be among so many community leaders who not only focus on personal success, but help our city and state prosper, help those in need, and provide a high quality of life right here in Minnesota. KK & Co. also would like to give a special acknowledgement to B Kyle, the President and CEO of SPACC, who not only gave a wonderful and inspiring speech about Saint Paul, but is doing instrumental work in leading and growing the St. Paul community! We are looking forward to attending more events with the St. Paul Chamber this year, and continuing to watch St. Paul grow, evolve and thrive. Calendars have always been my thing. In school, I would color code each of my classes and make sure that all my assignments and extra-curricular activities were added. As a busy kid, this provided a lot of stress relief. Now I’ve gone away from the traditional paper calendar and rely on Google Calendar. With grassroots work, you can’t always predict how your day is going to go and that can be difficult at times. Getting into a habit of time blocking has drastically improved my time management and sanity for the days that could have easily gotten away from me. Similar to what I used to do in school, I’m able to color code each of my activities on Google Calendar. I have a chunk of time for driving, media monitoring, responding to calls/emails, meetings, writing, and even 20 minutes to relax/recharge. Whether it’s to work, client meetings, visiting friends/family, or something else, you spend a lot of time in your car. In order to make sure I don’t get distracted by incoming emails, calls, or texts I make sure my phone is on silent. What’s been a game changer has been PODCASTS. When my phone is on silent I plug in a new podcast and focus on that. There are some really great options out there for development (career and self). I’ve grown to love my drive time because it’s a chunk of time in my day that I can pause from work or home life. Even with time blocking, tasks get added to my list throughout the week that I don’t always account for. When that happens, I like to make lists. When I first started making lists, I just put everything down and tackled the top of the list first. This is a fine way at achieved your goals however it might not always be the most productive. What I’ve found (through MUCH trial and error) is knocking out the difficult tasks first speeds up the process. If I allow myself too much time to think about the harder tasks, I tend to put them off. Getting them done as soon as possible makes the rest of the items way more manageable. Also…the physical act of crossing things out feels so satisfying. Okay, this might seem a bit obvious but bear with me! I am the first to say that after a long day the last thing I want to do is go work out. However, just going for a walk around the block or taking your dog to the park does so much to boost your energy levels—and your pet’s. In the winter this might seem daunting but you’ll feel better. Direct mail is a mail piece, sent to a donor or prospect, with an ask to give money to your organization. This does not include other communication with donors and supporters (which you should be doing)! Whether you are a nonprofit or candidate campaign you need to be communicating to your supporters with a fundraising ask at least four times a year. In most cases, it should be more often, but it depends on how much you are communicating with them in general, how large your donor base is, and if you have results from previous years to use as metrics. Tip 1 - There’s still time to get the mail calendar drafted for 2019! The best way to communicate with your supporters regularly and hold yourself accountable is to plot out when your direct mail should drop for the next year. Your calendar dates should really be spaced out – I prefer a February drop date for the first ask of the year and typically sends something toward the end of the school year before summer begins and the July 4th lull, again post Labor Day and then the Monday after Thanksgiving. Every state and organization is different, this schedule works for most of our clients but it may not for you – test it! Tip 2 - Use a personal story. You are raising money from people, who feel connected to you or to your organization. Tell them why they should care to give again. Every dollar matters whether it's a $10 or $10,000 gift. Each donor is valued and needs to feel the emotional connection to giving. Metrics also allow them to feel good about – what you did with their money and why you need more. Tip 3 - Be intentional and informed with your ask. Don't send a donor who gives $10,000 to your organization and ask for $100, and vice versa! Tip 4 - Measure it! How do you know if what you are spending on direct mail is working? Monitor the results. If you rented lists, how are they performing? Tip 5 - Use the Give-Give-Give-Ask model. This is good for all things in business (and relationships). Provide value, communicate with donors, build relationships and then ask for help. At all times, be genuine and honest about why you need funding and don't ask for money before you provide value to them. Direct mail fundraising is an entire workshop but if you are toying with getting started - these are a few good tips for you. As always if you need help give me a shout on my cell or email, always here to help! When folks think strategic communication plans they often think press releases, television interviews, social media posts and brand promotion. But when thinking about how to positively position your policy, your idea or your product to the public, grassroots advocacy should be part of your strategic plan because it can fortify what matters most and help sway public opinion. Here at KK & Co, we’ve seen firsthand in our work how helping every day citizens share their voice and get involved makes a real difference and impact on public conversation. Whether that’s on social media, in the newspaper or at the Capitol, grassroots advocacy adds real power to your message. It’s why we work hard to bring a grassroots angle to strengthen our client’s message and get them meaningful results. A quality strategic communications plan means sharing your message with the right people, by the right people and in the right way. Grassroots advocacy helps bring more voices to the forefront, championing what’s most important to you. Want to know more about engaging in a grassroots efforts? KK & Co has the experience and know how to answer your questions and get you results! We’re just four weeks into the 2019 legislative session and things are moving fast! Is your voice being heard? Is your issue being championed? With so many competing groups, interests and issues at the Capitol, let KK & Co. help you stand out this legislative session. Whether you’re promoting your organization, engaging stakeholders on legislation or bringing your message to lawmakers and the public, KK & Co. can help you navigate our political scene and get meaningful results. What can we do for you? Here are a few ideas. Does your association or organization have an upcoming day at the Capitol? Let us do the heavy lifting! We can set up meetings with your members and their legislators, book rooms, organize the logistics of your day at the Capitol, and much more. Working to get a bill passed at the Capitol or stop legislation from becoming law? Let us take the lead on grassroots advocacy, engaging stakeholders and the public to help sway opinions and give a face to the issues that matter to you. Need help pitching a story, setting up a press conference or authoring an opinion editorial? We can help you get your message to the public. Let our expertise and experience with media relations work for you. Do you know how to navigate a media crisis? Need training on how to engage with reporters? Let KK & Co. be there for you, providing talking points, media training, reputation management, communications strategy and more. Have another idea of how we can help you at the Capitol? Just ask! With hundreds of bills already introduced this year, a sometimes volatile political landscape, and so many new elected officials, it’s imperative that you stand out this session. Whether you’re a seasoned Capitol professional who needs additional help or you are brand new to Minnesota politics and don’t know where to begin, let our team’s expertise, experience and know-how work for you! Bridging – a local charity you can easily support! Our community is filled with so many incredible charitable organizations but last fall we chose to support a local organization called Bridging that is based right here in the Twin Cities. As the weather turned, our friends at Bridging said their big need heading into winter was blankets so we held our first annual blanket drive. We put out the word to friends and family about this partnership and within a few weeks we were able to round up about 100 blankets before the holidays. While dropping off the donated blankets, we had the opportunity to see Bridging’s good work with a tour of the Roseville facility and the shopping process. · More than half of the individuals Bridging serves are children under 17 years of age and 77% of clients have a household annual income of less than $15,000 per year. Working with Bridging was such a great experience and we encourage you all to help. Most of us could do a quick purge of household essentials that aren’t being used. Instead of throwing those items away, a donation to Bridging would greatly impact a family in your community. KK & Co has made a New Year’s resolution to be more active with different organizations by volunteering and promoting the amazing work these organizations provide so standby for 2019 projects! Bridging is always looking for volunteers or donations. If you’re interested in learning more, volunteering, or donating your gently used/new household items please contact KK & Co. or visit Bridging at https://www.bridging.org/engage/.